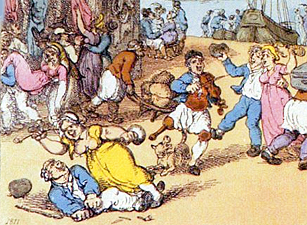 The Poor Law Amendment Act of 1834 meant that more and more paupers were forced to enter workhouses, since outdoor relief was essentially eliminated. This increase in admissions meant that workhouses were overflowing, and the Poor Law Board needed to find places to house all of the new admissions. One way that they accomplished this was by sending pauper boys to training ships. These ships were generally moored on the Thames, and the unions near the area could send their pauper boys to live on the ships once they reached the age of twelve, with the option to remain on board up to the age of seventeen. This was extremely helpful to the over-crowded workhouses of London. On board the ships, the boys learned how to wash and mend clothing (essential for sailors) and how to keep their personal areas clean. They learned to make sails and ropes, to repair the sails when they ripped, and other skills necessary for sailing and rowing. The boys were also expected to complete ordinary schoolwork and to learn to swim. Essentially, these training ships prepared the boys for entrance into the Royal Navy or to join merchant ships, which would (it was hoped) prevent them from being a burden to the Poor Law system for their entire lives. Training ships fulfilled two necessary aims in the nineteenth century: to house the large number of pauper children who were a burden to the government, and to provide skilled sailors to the navy. 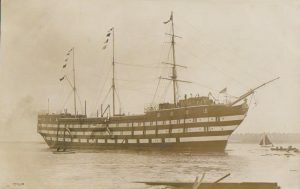 It was generally agreed upon by the government that the training ships provided excellent care and schooling for the boys, and that keeping them out of the workhouse (but also off the streets) was mutually beneficial. 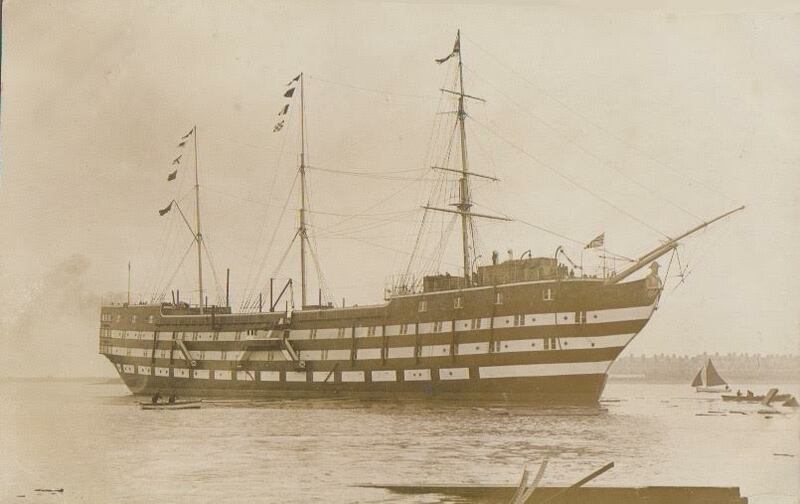 I would point out that there is one establishment which has entirely escaped censure-in my opinion, deservedly so-vir., the Exmouth training ship, an old wooden frigate, on board which about 600 boys live and are educated. If 600 boys can be healthily and successfully trained on board the Exmouth, I can see no self-evident reason why a school on the Surrey Downs with equal number should not be equally successful. Not only did the Poor Law Board want to send boys to the ships, the boys themselves as well as their parents were very happy with the situation. This would make sense, considering the stigma of entering the workhouse. Training ships were valuable assets to the Poor Law Board, and it can be assured that they helped many young boys find jobs outside of the workhouse and were a benefit to nearly everyone involved. Phil Carradice, Nautical Training Ships: An Illustrated History, (Stroud: Amberley Press, 2009). “Thames Training Ships,” The Times, 11 June 1877. “The Goliath,” The Times, 11 October 1871. Sir Allan Powell, The Metropolitan Asylums Board and its Work, 1867-1930, (London: Metropolitan Asylums Board, 1930), 54. “The Burning of the Training Ship Goliath,” The Spectator, 1 January 1876. Robert Headley, “Children Under the Poor Law,” The Times, 7 Jan 1897. Norman Longmate, The Workhouse, (London: Maurice Temple Smith, 1974), 167. Very interesting as I just found out my ancestor who was in Hackney workhouse was sent to the Exmouth. Hello! What a find! I was searching information on sail mending aboard ships in the 19th century and came across your article. It’s remarkable because I’ve been researching the Poor Laws, orphans, and the Royal Navy for a story I’m writing. And you have integrated these subjects for me! Can you recommend a source that might have sail repair techniques used in the mid-late 19th century? A really interesting article, thank you. My grandfather, William Wickham served on the TS Exmouth. William’s stepfather thought it would be an excellent place for him, although it’s not clear if he was forced to go or admitted as part of the Workhouse scheme. I have a couple of documents with conflicting info regarding his time on board, making it difficult to know what’s accurate. The Port Towns and Urban Cultures group is dedicated to furthering our understanding of the social and cultural impact of life in port towns from the eighteenth century to the modern period. Find out more. 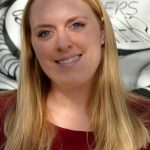 You may like to meet the project team. or view our resources page. You can also keep up to date with latest events and project news by following us on Facebook and Twitter. If you have any technical issues, please contact scott.simmonds@port.ac.uk. The University of Portsmouth running this project in partnership with other institutions and organisations, including the National Museum Royal Navy. © 2019 Port Towns and Urban Cultures. All Rights Reserved.